What do you mean you never heard of any of those grapes? For one, they are all synonyms of the same grape, just from different regions. The grape in question is a black-skinned wine grape grown widely in Austria and Hungary, and to a lesser extent in neighboring Germany, Slovakia, Bulgaria and Croatia. Miniscule quantities are also grown in the United States, most notably in New York’s Finger Lakes but can also be found in various parts of Washington state (the Rattlesnake Hills, Horse Heaven Hills, Yakima Valley), and such far-flung states as California, Michigan, Indiana, Pennsylvania, Rhode Island and Colorado. The common feature in Blaufrankisch wines from all of these places is a fruit-forward profile with aromas of spiced black cherries. In Austria, Blaufränkisch is the second most popular red-wine variety behind Zweigelt – a crossing of Blaufränkisch with Austria’s other signature red variety, Saint-Laurent. Blaufränkisch is grown in almost every Austrian wine region to some extent, but its stronghold is unquestionably Burgenland. Classic Austrian Blaufränkisch wines are intensely colored, medium-bodied reds with brooding, black-fruit flavors and a hint of peppery spice. Those made around Lake Neusiedl, and in Sudburgenland, can be particularly full-bodied and spicy. In Hungary, where it is known as Kékfrankos, the variety occupies almost 20,000 acres (8100 ha) in total – nearly three times its Austrian coverage. The majority of this is located in the vast but little-known Kunsag region, where it is rarely made into anything intended for export. Its other Hungarian homes include Sopron in the northwest (on the eastern shore of Lake Neusiedl) and Eger in the northeast. Both of these regions have strong histories of wine production, and have the potential (in the right hands) to lead Hungary into a new era as a wine-producing nation, with Kékfrankos as their flagship grape. It has already played a pivotal role in Hungary’s most famous red wine, Egri Bikaver, better known as Bull’s Blood. Blaufränkisch was long thought to be genetically identical to Pinot Noir, and even Gamay Noir, which explains its Croatian and Bulgarian nicknames Borgogna and Gamé. Modern DNA profiling has now shown that it is at least related to both of these varieties, as they are all descendants of Gouais Blanc. And I’m telling you all this for what reason? Well, I came across a Hungarian Kékfrankos that is pretty tremendous. The 2010 Weninger Kékfrankos Balf is a charming wine with great varietal character. The wine is from Sopron, specifically the small village of Balf, which is on Lake Neusiedl. The warm thermal springs of the area are loaded with minerals and not only contribute to ripening the grapes fully, but also add levels of complexity and minerality to the finished wine. The grapes are selectively hand harvested with only native yeast strains used to start the fermentation, which takes place in stainless steel tanks. After three weeks of maceration, the wine is pumped into large oak barrels, held in passive, non-climate-controlled cellars. The wine is then put through full malolactic fermentation to soften the acids and broaden the palate. After a year in barrel, the wine is bottled without being fined or filtered. The vineyards are estate owned with vines varying in age from 13 to 40 years. Viticulture is biodynamic and uses no pesticides. In 2010 there were 6,300 bottles produced, a comparatively small production by most modern winery standards. The wine is delightful. Bright, lively fruit dances on your palate, held aloft by firm, crisp acidity. Fresh cherry with dark notes of rose petal and violets abound. On the finish, loads of black pepper and allspice combine in layers of complexity. Ideal for summer – the wine takes a slight chill well and the spicy finish echoes well the tastes of the grill. At an average bottle price of $9.99 before the discount, you know that 12 of those 6,300 bottles will find a home in my wine cellar! My apologies for touting yet another Italian Barbera, but when I find something truly remarkable, I feel compelled to share. Castello di Neive is among my favorite Piedmont producers. Their wines are of the highest quality and have a very traditional flavor profile. That said, the wines are somewhat pragmatic, meaning that for all their traditional character they embody modernity. Castello di Neive, and its 150 acre estate are owned by the Stupino family – Anna, Giulio, Italo and Piera. They were all born in Neive, and so were their parents, grandparents and great-grandparents. The history of the company began when their father, Giacomo, started to capitalize on both his experience as a surveyor and on his knowledge of the area, to purchase, whenever possible, vineyards and land in extremely favorable locations. In the small cellars of their home, they began the first production of wine for domestic consumption, which they sold in bulk. The first vineyards Giacomo acquired, which have become synonymous with great wines, were Messoirano, Montebertotto, Basarin, Valtorta, I Cortini. In 1964 they purchased the castle with its spacious cellars, and a few more vineyards in Santo Stefano and Marcorino, as well as additional land from the castle’s previous owner, Count Guido Riccardi Candiani. The acquisition of all these vineyards, along with the purchase of the historic castle was a turning point, which drove the family to renovate the castle’s cellars, and to make significant investments to restore the vineyards, long neglected by previous owners. With the upgrade in the cellar came the introduction of more modern wine making methods. When Giacomo died, in 1970, Giulio and Italo took over operations and oversaw the transition from tenant farming to direct management of the land. With the help of a talented and skilled winemaker, Talin Brunettini, Castello di Neive began to bottle its own wines instead of selling them off in bulk for sale by others. Castello di Neive has continued to lead in Piedmont, establishing clonal programs for the native Arneis grape. The wines from Castello di Neive are among some of the finest in Piedmont, unparalleled except for a select few producers. So imagine my excitement when their single vineyard Barbera, the Santo Stefano popped up on the radar screen at a very reasonable price. The Santo Stefano vineyard, as noted above was purchased in 1964 and the story on the web site tells of a piece of property that was fallow and in a questionable state. Apparently, the patriarch, Giacomo brushed aside the warnings, purchased the land and proceeded to restore the site and plant vines. 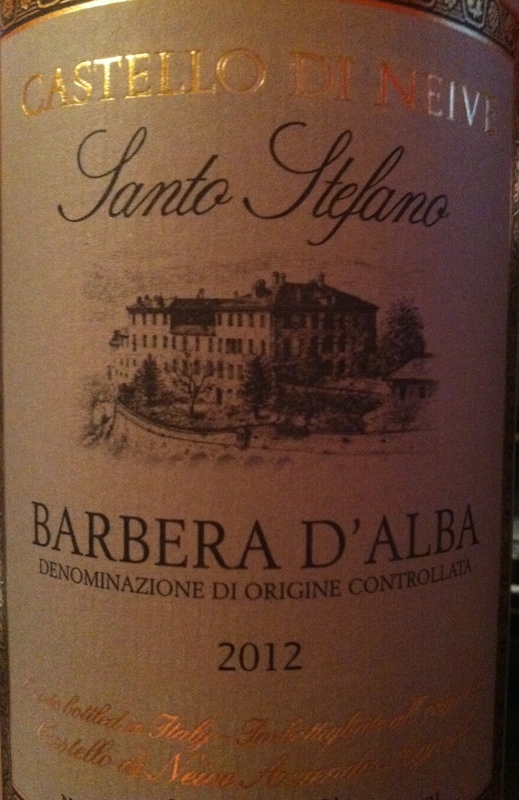 Within short order, the vineyard was producing amazing Barbera. The 2012 wine is a relatively modest 10,000 bottle production, from 20 – 30 year old vines, grown on calcareous marl soil. The vineyard is hand harvested using traditional wooden boxes. The grapes are put through a traditional fermentation process, with pump over, for about 10 days and then allowed to macerate for another 10 days. Once complete, the wine is moved to large, 1,000 gallon French oak barrels to age for 8 months. The wine is then bottled, unfiltered and held for another 3 months before release. When I first tasted the wine, I was pleasantly surprised at the depth of fruit and the lushness of the palate. Black cherry and blackberry saturate the flavor, with well integrated tannin to give the wine structure and balance. Layers of complexity on the finish, with hints of anise and dried herbs maintain a connection to the traditional flavor characteristics of the Barbera grape. The wine has good aging potential and at $19.99 per bottle before a discount, represents a tremendous value. Not the cheapest Barbera on the shelf, but certainly one with a fine pedigree and great provenance.